Between Los Angeles and San Francisco lie hundreds of miles of California landscape. Somewhere out there I snapped a photo out the car window. A few years later a painting emerged. This one’s a bit different from the rest. No trees. No water. No buildings. Just the dry grass-covered hills of California glowing in the sun. The absence of features like trees leaves the painting with a spare, abstract composition. Land and sky, that’s it. 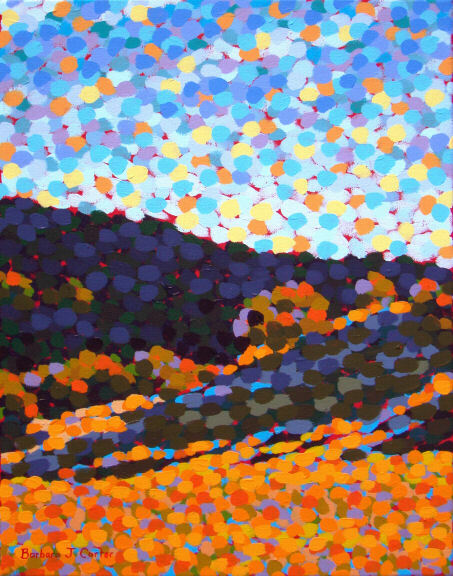 “Hills” painting by Barbara J Carter, 2012, acrylic on canvas, 18×24 inches. Pescadero Beach by Barbara J Carter, 2012, acrylic on canvas, 11×14″ (frame 17×20″). I started this painting last year, but abandoned it halfway through. What happened was I started working on a very similar scene in a much larger format. The larger painting took over. It was so much more dramatic than the small one. The little one seemed unnecessary, redundant. I set it aside. In fact, I thought about destroying it. It was just a smaller version of a very successful big painting. It wasn’t going to be anything but a lesser copy. And I hate copying myself. But I couldn’t bring myself to trash it. So I set it aside. I turned it to face the wall and ignored it. It sat there for months. Time does a funny thing. What seemed like a “copy” then, now seems like a different take on a similar theme. Enough time has passed for it to become its own painting: a small window onto a similar scene, but with its own unique take. I hauled it out and finished it this month. I’m extraordinarily pleased with it. Sometimes it just takes a little time to find the right approach. “Wind Wolves Triptych” by Barbara J Carter, acrylic on canvas, 40×90″ (3 panels), 2011. It’s the biggest triptych I’ve painted to date. Seven and a half feet wide! The painting depicts a set of hills in the Wind Wolves Preserve, a large privately owned conservation area that is open to the public. Located in the southern end of the San Joaquin Valley of California, it’s a beautiful space: an unspoiled wide valley surrounded by rugged hills. The valley floor is carpeted each spring with fabulous wildflowers. It’s a bit of a drive from Los Angeles, but worth a visit. If I remember correctly, it’s open on weekends and admission and parking are free. The facilities include very nice bathrooms and a few picnic benches, and very good trails for ambling all about without crushing the flora. Dog friendly too (we don’t go anywhere we can’t bring our pooch). “Two Trees” by Barbara J Carter, acrylic on canvas, 40×30 inches. “Two Trees” depicts an iconic Californian scene, a pair of scraggly oak trees atop a golden-hued hill. I like to emphasize the honey-amber tones of the dry grass that covers so much of California throughout the dry season. For this painting, I also pulled those yellow-gold tones into the sky to make the silhouetted trees just that much more dramatic. Who says the sky always has to be blue? A few days ago I thought this painting was finished, so I set it aside and turned my attention to another. But something was niggling at me, so I put it back on my easel and worked a little more on it. I shifted the colors in the hill more emphatically to yellow-orange tones, and downplayed the cooler colors like blue and green. (How do I do this? You’ll have to ask me in person!) That really integrated the painting into a unified whole. So now it’s really finished, and ready for the big art show. See you there! Kings Mountain Art Fair September 3-5, 2011. The complex undulations of the hills and meadows at Satwiwa caught my eye. (I’ve blogged about Satwiwa before, here.) It seemed the intriguing shape of the land was just begging to be captured in a painting. So I did, and this painting, Satwiwa 2, is the result. You can receive my postcards too! Just sign up for my mailing list here. Oh, and of course the painting itself is available for sale. Click here for that information. New Painting: “Cheseboro,” or is it Chesebro, or maybe Cheeseboro? There seems to be some variation in the way the name is spelled, but in any case it’s a mighty fine place to take a hike. And maybe even snap a photo that you eventually turn into a painting. Or anyway, that’s what I did. "Cheseboro" by Barbara J Carter, 2010, acrylic on canvas, 14x11"
When I say I “eventually” turned the photo into a painting, I do mean eventually. Like a lot later. I hiked this canyon in December of 2008, snapping several photos as I usually do. I stored them on my computer. After a while I printed some out, and started a painting. That was sometime in 2009. About 3/4 of the way through the painting, I got stuck. So I did what I always do when I’m stymied by a painting. I propped it up in a corner of my studio and left it alone. For a long time. It turned into a verrrry long time. Finally, about a month ago, I decided it was time to finish it. And it wasn’t that hard, either. It just came to me, and I put on the finishing touches with surprising ease. Sometimes I need to let things stew in the back of my mind for a while before I can finish them. I think this one’s the winner for longest “stewing” time. But that’s OK with me. I’m happy with how it came out, however long it took. This painting is for sale. Click here for purchasing information.